​We hit the road last week for a two-week vacation in Florida. Of course, part of a vacation means there will be fast food, on-the-go snacks, and less-than-ideal meals. I’m not afraid of that, and I don’t want to live in a bubble, but I try my best to find the right mixture of convenience, health, and frugality, which isn’t easy. While I know I can’t plan every meal for the entire vacation ahead of time, it’s pretty simple to get started on the right foot. Here is the plan for tomorrow’s on-the-road menu. Nothing motivates kids to get in the van faster than the promise of cookies for breakfast as soon as we are on our way. But no, we’re not passing a bag of Chips Ahoy around the van! Mix ingredients in order listed. Preheat oven to 350°. Scoop teaspoons of dough onto cookie sheets or press into cookie bars. *If you use honey, I would use a little less, with water making up the difference. **If you use one cup of butter instead of oil, only use one cup of flour, or you will need to add water. *** You could just add chopped walnuts, but my kids don’t like nuts in cookies. It doesn’t bother them this way. 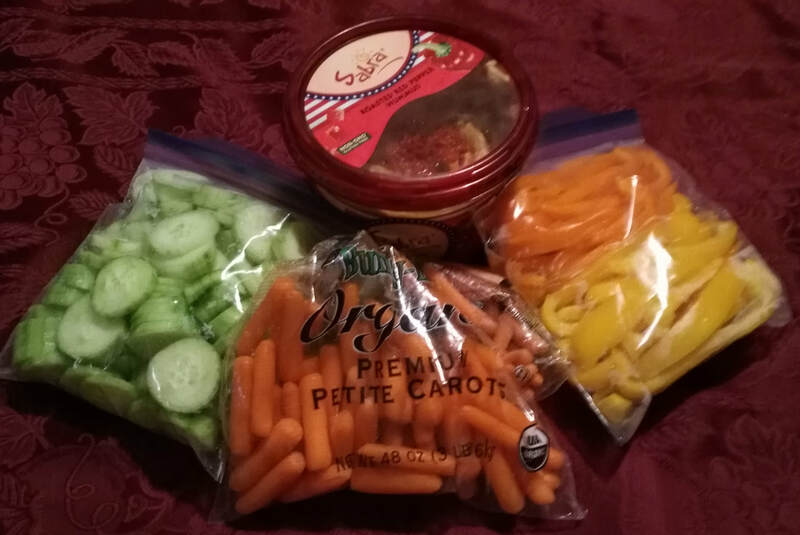 For lunch, I just chopped up all the veggies left in the fridge to be eaten with hummus and crackers. They are delicious, full of protein, iron, and healthful fats. I prefer these refrigerated, but this isn’t necessary, making them a perfect snack for on the road. They will keep for at least a week stored in an airtight container. Combine everything but coconut in food processor until it looks like a sticky ball. Press into balls or bars, using coconut for shaping if desired. Pictured is a triple recipe. ​I don’t write much anymore. In the past, I had aspirations of being a writer or otherwise using writing in whatever I ended up doing. Since I had the idea to begin sharing our health journey on this blog, I’ve been hindered by fear that my writing will simply not be good enough. You see, in my life I personally know several people who are really good writers. Superb, should-be-published, excellent writers. Then online there are the thousands of people who are really good writers. There are also many people who self-publish books and really should have hired a proofreader, but I digress. So I sit, hindered. Well-organized thoughts will hit me while I’m driving home from a store, or in the middle of a chore I can’t interrupt, but never while I sit at my computer. Words and ideas elude me. But doing nothing because of the disease of perfectionism is completely contrary to the idea behind this blog! What if we apply the same fear to our health? What would that look like? But what if we silenced that voice, that fear, that perfectionism and made positive changes in simple, practical ways. What if a simple dinner of spaghetti and salad was good enough? If you don’t have an hour to exercise, what if you settle for an after-dinner walk? What if doing a little research and deciding on a few healthier options at the grocery store was good enough? ​And what if I ignore my fears and let the words that come to me be good enough? My goal is to bless others by helping them be healthier, not to dazzle and impress with my writing. So if your goal is to bless yourself and your family with better health, not perfection, then you’re in the right place. What are some of the fears and concerns that keep you from making healthier choices? Obviously, the work is still there and it must be done eventually. The balance is figuring out how to get the essentials done, fix real food for your family, and actually have time to enjoy your family. I’ve recently drifted back into the habit of putting my kids to bed before I cleaned up the kitchen. Tense and irritated at how long they were taking to get to bed, I'd grow more and more exasperated, knowing that when they FINALLY got to bed I'd be stuck with the entire kitchen and dining area to clean up by myself. This week I'm working on breaking that routine, again. They’re old enough to help--well, all but my little girl: she tries to sweep and just makes a bigger mess. I'm starting again with the boys helping me clean up after dinner, even if dinner is later than I'd like. They're all doing something, even if it's taking the little one to the other room to read, and I feel less like a “cleaning lady.” It's also giving me permission to enjoy putting them to bed, because I'm not so burdened by the mess I know is waiting in the kitchen. Tonight, I served rice and vegetables for dinner. Plain rice and a pan of mixed vegetables. Not a bit fancy. I put butter, pink salt, nutritional yeast, and other seasonings on the counter next to the pan, and we all seasoned our rice to taste. Simple. Rice is real food. It's one of the simplest, most inexpensive real food items at the grocery store. I usually choose brown rice, but it takes longer to cook when I’m in a hurry, so I try to have some white rice on hand, too. And I now happily enjoy the convenience of frozen vegetables. I used to feel like all my vegetables needed to be fresh from the produce section, which of course meant I had to wash and cut everything myself. But frozen vegetables are allowed to ripen on the plant, which means they get their full nutrient content. They're typically picked, washed, and frozen soon after harvest, which means they're retaining that nutrient content. A lot of items in your produce department have to be picked weeks before they get to you, which means they have to be picked early so they don't go bad before they get to the store. I'm certainly not against fresh vegetables, and farmer’s market season is a great time to buy fresh, local vegetables that were picked ripe. I used to feel guilty about dinners like this, like I somehow failed, that I didn't really “cook.” But I taught a childbirth class tonight, my children came in from playing outside and had stories to tell me, so was I really supposed to be pouring over recipes or hurriedly trying to put together a complicated concoction? We sat together, seasoned our rice and vegetables and enjoyed each other. After all, it's because I love my family that I want to keep them healthy and do the best I can for them. Since I love them, I want to be present with them and enjoy them, not just be working around them. I do “really cook” sometimes, but not all the time. It happens less often these days, with a barely-three-year-old underfoot and classes to teach. But the fact that my oldest is now taller than I is a constant visual reminder that soon enough that sweet three-year-old will be grown, too. Maybe she will help me cook, and we can come up with some gourmet meals together, but for now we might have some more simple nights of rice and veggies. I was thrilled the first time my then-four-year-old walked over to me during a dinner with friends and asked, “Mommy, may I have another salad?” Trying not to dissuade him by looking too happy with his request, I got up and fixed him another salad. He has found this to be the easiest request to get an affirmative response out of me. Even if I've already put all the food away and finished cleaning the kitchen, I can't help but oblige a child asking for more salad. I paused, considering, “Daniel, I think … maybe … you've had enough salad. I mean, I don't think it's going to hurt you, but you might need something with some more calories.” I know I wasn't convincing, and I'm still trying to decide whether I was wrong, but at that point I was trying to avoid being awoken at 3 a.m. by a little voice whining about being SOOO hungry. For the last couple of years I've been telling my friends about the benefits of green smoothies. “They're like a multivitamin in a glass, only better, because they're whole-food.” “They're wonderful protection against osteoporosis and anemia, and they're relatively cheap and easy to make.” I'd even say, “Kids love them. Just call it an Incredible Hulk Smoothie and kids will think it's great.” Ironically, my own kids didn't buy my enthusiasm, and they finally went on strike. I served salads before dinner, and I told my boys it was because they were the most important foods. I worded it that way so they didn't get the idea that it was the undesirable thing you have to eat before you could get “the good stuff.” I know there are different schools of thought on when salad should be eaten, but I didn't do a bunch of research on “before vs after the meal.” I simply figured it would be better received if they were hungrier. It was not presented as optional, but it was not forced, either. A kid who truly ate most of it but said there were “just too many dry greens” at the bottom was listened to. Requests to stop getting the “purple lettuce” were heeded. (They were right- that stuff is bitter!) My child who was most resistant was allowed to eat his salad “bite for bite” with his other food, and then eventually was allowed to have a veggie plate instead. At first I thought I was not supposed to give in to him, but I finally realized that if I forced the issue I was going to make him hate salad. He would likely never eat one again once he left my house. Later we realized he has some real sensory processing issues, so the greens really were bothersome to him and I'm glad we didn't force him. He spent years making decorative veggie plates for himself and now he wants to be a chef. Also, now he will eat salad. I'm a big fan of salad dressing. I let my kids, for the most part, pick their dressing. I've actually had to discourage one son from eating his salad plain, because we really do need the fat to absorb the fat-soluble vitamins in salad. (See http://ajcn.nutrition.org/content/80/2/396.full) We've gradually progressed from unhealthful, to not-so-bad, to better-but-expensive store-bought dressings. My kids now think it's fun to make our own. Just start with a basic recipe online and tweak it based on preferences and what you have on hand. It really is easy, I promise. There have been stages in my life when I know I could not have handled having to do even that one small extra task, so if that's where you are, don't worry about it. Pick a dressing that will get your family eating salad and don't stress about it. Stress isn't good for you! I know some people like to hide vegetables in creative ways, assuming their children won't eat them and could never like them. I think that's a valid survival strategy for a very difficult child who likely has nutritional deficiencies, but I also think we need to present our kids with the best food options as the best food options. There are ways to make vegetables, even salad, accepted by our kids and even fun. I love the fact that my boys are now taking ownership of their options--salad vs green smoothies--and even taking on the job themselves. I took his advice. I realized at some point that I don't like that over-stuffed feeling of having gorged myself at a meal, even if it's a holiday. I'd rather NOT have a stomach ache, thank you, and I can come back later for more. And you know what? My uncle was right. So, while I've never been obsessively trying to keep my weight down, I just sort of learned when to stop eating. Later, I would learn more about ingredients and food choices. I've also observed a couple of times in my life a thin person in an otherwise-not-thin family, who at first glance appears to have just inherited “the good genes.” Further observation reveals some different food choices. I lost my favorite uncle a couple of years after our conversation over my mom's kitchen table. He had a heart attack and died at age fifty-two. He had a wife and children who loved him and we would all have loved to have had him around longer. His youngest brother did not make it to fifty, and I never knew my grandmother because she passed away so young. While my pre-teen self was dealing with the fear of “being fat,” my grown-up self wishes I could have had those people in my life longer. Are there genetic predispositions? Sure. But there's also emerging evidence that we can affect the way our genes work by what we eat. I can look at my family history and say that I am likely to die of a heart attack in my early fifties. Given my choices and resulting health, I don't think that's very likely. I am convinced that there are many of us using inheritance or metabolism as a cop-out. There's actually very little difference between most people's metabolism. So, maybe it doesn't just run in the family, maybe families pass down eating habits, not just genes. Whether we adopt those habits is up to us. I'm not going to debate methods of cancer treatment here; there are plenty of sites and resources for that. I am a firm believer that each person has to do their own research, and come to their own conclusions that they can be comfortable with. And I am a firm believer in logic. Had the nurse given my mom a study that showed that a Vitamin C flush would not work, she would have had something to go on. But the idea that the acid in Vitamin C, a natural, water-soluble substance, would be harsh enough on the body to give concern to the chemo nurse? The logic hit the floor with a thud. It's easy to get bogged down with the “what to dos” of getting or staying healthy. Studies can be incredibly deceiving, sometimes intentionally. There's a new “revolutionary” diet out every few months and people really want to know what they should and should not eat. I'm glad there's such growing interest about food and healthy lifestyle choices, but the quest doesn't need to be so confusing. There's no reason to throw logic out the window where your health is concerned. One of the ways we do this is when we give ourselves over to the experts and take them at their word, no matter what. We do this all the time, especially when we simply don't ask the right questions. We have to remember what type of doctor we have chosen, and what they are trained to do. Most of our conventional doctors are trained to recognize symptoms, diagnose disease, and prescribe the corresponding medicine. That's not necessarily a bad thing, and sometimes that is what is needed at the moment. But don't rely on their drugs and procedures without bothering to ask questions and advocate for yourself. I look back at cringe at how I just went along with it for so long. I really didn't have anyone encouraging me to do my own research and ask the right questions. I would do things differently now and I've learned a lot. If your doctor is telling you, “You're [organ] isn't producing enough [vital substance],” maybe rather than, “Which drug fixes that?” the logical question should be, “Why not?” There is not a drug deficiency that leads to a health problem known to man. Do I have a deficiency of some sort? If I do, is it because it's lacking in my diet? If so, how can I get more of what I need in my diet? If not, is there an absorption problem in my gut? What's at the root of the absorption problem? Do I need a drug to fix the immediate symptoms while I work on getting better? Do the side effects of the drug outweigh the benefits? We need to ask questions that take us to the root of the problem. Ask “why,” and “why,” and “why” again, if you have to. And don't drop logic on the floor when you make your choices. After a beautiful drive in the late-October weather, pointing out trees of unusual brightness to my ten-year-old companion, I found myself, yet again, standing in the grocery store frustrated. Perturbed. Irritated. “How can I possibly make chocolate-covered pretzels for the party when all the chocolate made for melting has hydrogenated oils in it? !” Reaching for the bright blue bag of the pre-made chocolate-covered pretzels, I noticed that they didn't contain the offending ingredient. I calculated the cost of buying enough for 14 kids--nope! I finally gave up and went home with bags of chocolate chips and white chocolate chips. You have to be careful here: “chocolatey morsels” and other such deceivers are out there in rampant numbers. Ghiradelli white chocolate chips and the good old Nestle Toll House chocolate chips do not have partially-hydrogenated oils in them. I headed home hoping they would melt and re-harden like I wanted. But, wait! Chocolate chips?! This is supposed to be a health blog! Ah, yes. But I have kids. And I live in the real world: a world where there are parties and camping trips, lock-ins and field trips--an unending barrage of sugar-laden, fat-filled festivities. And I must navigate, trying to be mindful of my children's desires to be normal, fit in, and eat the food that looks so good! Thus my dilemma on this beautiful October afternoon—Halloween, my least favorite day of the year. Not only is my mind full of questions about the spiritual implications thereof, but there is also the sugar. Think about it: a fun-sized 3 Musketeers bar has the equivalent of 2 teaspoons of sugar in it. How many candy bars do most children eat on this night?! For me, it's just not worth sacrificing my children's health with such a massive amount of sugar for the sake of having fun or keeping a tradition. We have never gone trick-or-treating, but have done various other fun things around that time of year. We have chosen to do something else every year, even if it means making popcorn and watching a movie or playing games together. This year I threw a party, which I hope to make our own tradition. My house was full of costumes, games, and chaos. Every family brought a crockpot of soup to share, I made some cupcakes, and we did a piñata variation that allowed kids with restricted diets to participate, too. * Melting non-hydrogenated chocolate chips onto pretzels was more time-consuming than buying pre-made bags of junk food, but it was worth it. I want my kids to have fun, happy childhood memories without thinking that having fun means over-indulgence or making yourself sick for the sake of sweets. I hope to strike that balance. 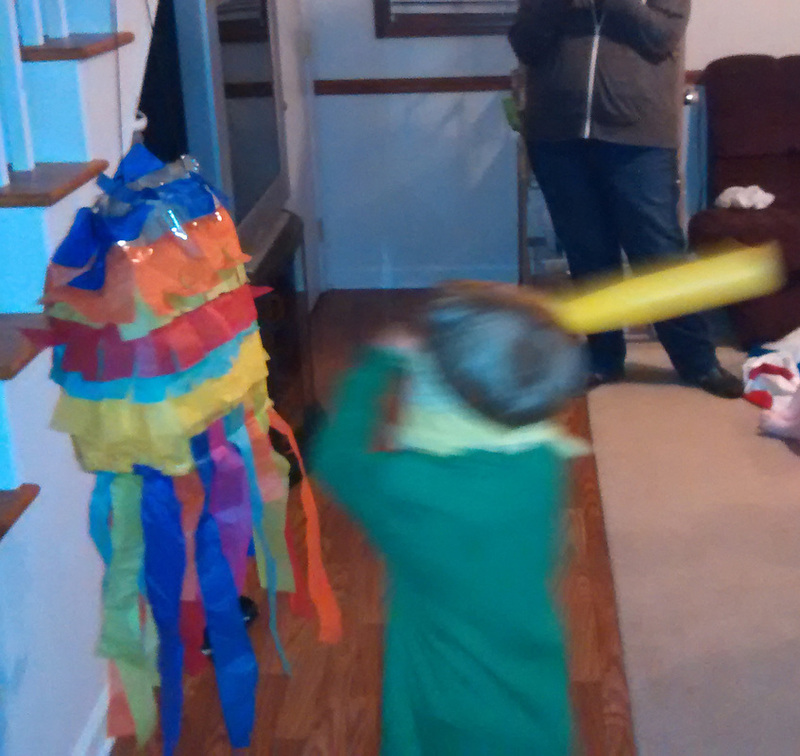 *We made a ﻿paper-bag piñata﻿. Instead of just filling the bag with candy, we filled it with paper bags with kid's names on them. We finished filling the bags while the kids were playing other games, and each mom brought things she knew her child could have and would like. I also cut pieces of cardboard and placed them in each bag to protect the goodies from being smashed.